Cool and clear conditions are expected today with highs in the 40’s to low 50’s under sunny skies. Today will feature mainly sunny skies with a return to cooler temps as high pressure moves closer to the region. Expect highs in the 40’s to lower 50’s with breezy WNW winds making an appearance as well. Gusts to 20mph are possible. 5:10 AM Radar Showing Very Heavy Rain Across NE Areas With Lighter More Scattered Precip Back To Our West. Our long-awaited storm is here and heavy rain is falling across the area with the expected strong winds as accompaniment. The heaviest of rain is north and east of Portland as of 5:15 this morning and this area of intense rain/wind will continue to move NE in the coming hours. 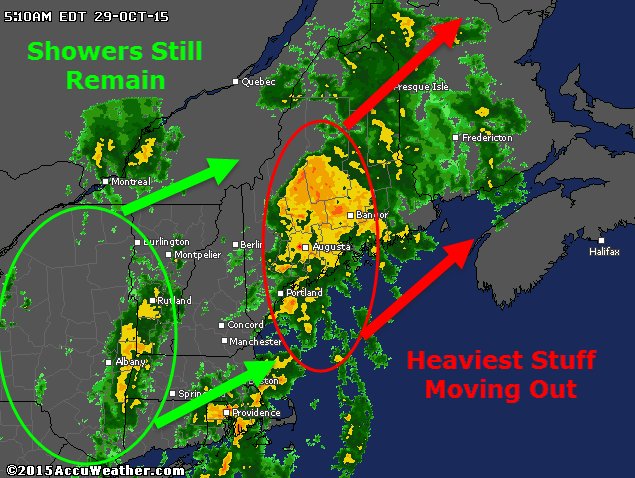 Behind that lies a batch of very heavy rain over SE MA and lighter showers over eastern NY. The SE MA rain is moving NE and will likely impact the midcoast with another round of torrential rain and gusty winds. More showers lurk back in NY associated with cold front #1 today and expect one last shot at intense rain and driving winds as this moves through. Behind those showers, which arrive 9-10 AM, expect clearing skies and warming temps. By mid/late afternoon, temps in the 70’s are likely under partly sunny skies. Another cold front moves through this evening which touches off some showers and possibly a few thunderstorms too. For a minute, it just may feel more like August than October. Temps drop a bit behind the front but a continued stretch of very mild weather looks to be on the way for the next week or so. Our upcoming rain and wind event remains largely on track and only minor adjustments are needed to the forecast this evening. 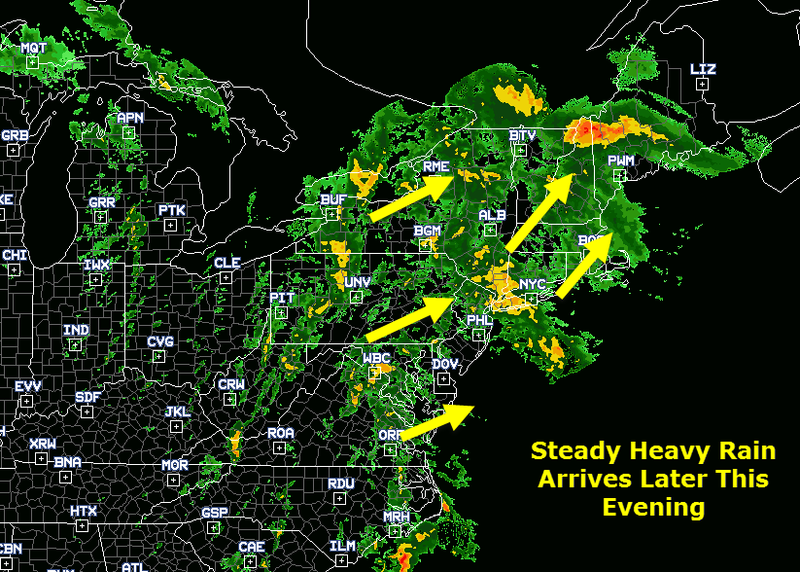 Rain is starting over western and northern areas but most of the steady heavy stuff lurks back over NY and points south. Rain will continue to overspread the area this evening and will become heavier as the night goes on. Winds will also increase gusting over 50 mph at the coast where a wind advisory is up. Lesser winds are expected inland but some gusty conditions are still likely. Total rainfall totals remain the same with 1-1.5″ likely for most with higher amounts to 2-2.5″ on the south facing slopes of the mountains. Rain winds down tomorrow morning along with winds but temps will be on the rise getting up into the 70’s! Cooler weather is likely for the end of the week. Today will feature the arrival of our storm system that I have talked about for a few days now. We start off nice and chilly this morning with some breaks of sun before clouds finish overspreading the area later this morning. Winds increase along with clouds today out of the east shifting south-east and becoming quite strong by evening. Rain will approach the region arriving in western areas around 3-4 PM and eastern areas closer to 6 PM. The worst conditions will arrive around midnight tonight with heavy rain and high winds peaking through 7 AM or so. Wind gusts to 60mph are totally in play for coastal areas, the farther east you go up the coast the more likely you are to see that type of wind. Winds will be lesser inland but will quickly increase again with elevation especially above 1-2 thousand feet. A general 1-1.5″ of rain is likely with more in the favored SE upslope areas. I’ll have another update as the storm starts up this evening. Not too much has changed since yesterday in terms of our upcoming heavy rain event. Here’s a quick updated rundown of what to expect. Rain moves in during the evening hours tomorrow arriving in SW areas around 5 or 6 tomorrow evening with most of the area seeing rain by 7 or 8 PM. The heavier rain will hold off until later in the evening beginning in the west around 9 and spreading east through midnight. 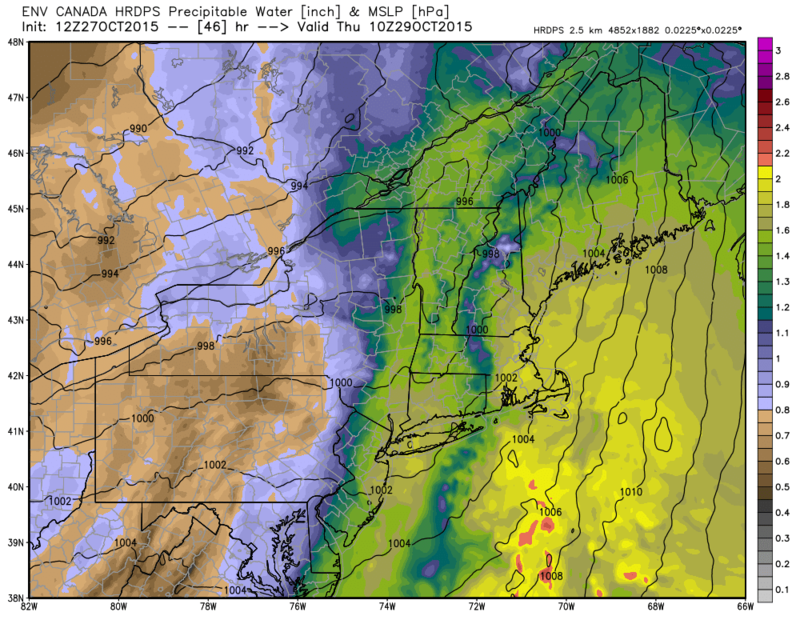 Between midnight and 6 AM or so, expect the worst conditions to occur with heavy rain being driven by strong winds. While available moisture (Precipitable Water, shown above) is quite high, as well as forcing for wringing out that moisture, the ideal parameters are only really in place for about 6 hours early Thursday morning. As a result, total rainfall will be limited somewhat compared to if this was a more slowly moving system. 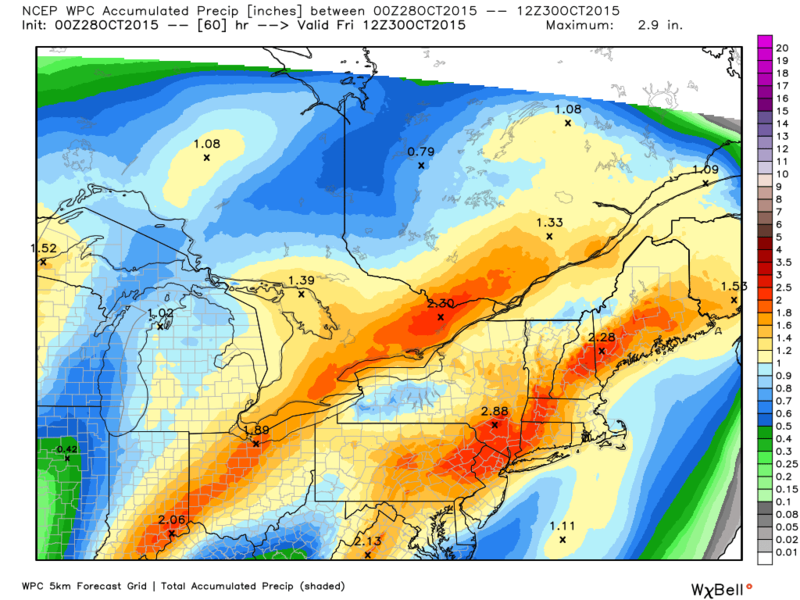 A total of 1-1.5″ of rain is likely with 2-2.5″ amounts on south-facing mountain slopes. 12Z GFS BUFKIT Plot Showing 50kt Winds Below The Mixing Layer Early Thursday Morning. Winds will become gusty tomorrow afternoon out of the SE as the front approaches. Expect winds building throughout the day with peak gusts arriving in the same 6 hour window as the heaviest rain from 12-6 AM Thursday. Most areas should see 15-25 mph winds with gusts to 35mph while the coast sees 25-35 mph winds gusting to near 60 mph. The plot above shows winds (everything but the yellow line, in knots) and the mixing layer (yellow line). Any winds below the yellow line are eligible to mix down to the surface in heavy precip. In heavy precip early Thursday morning, someone along the coast is likely to see some of those intense winds aloft mixed down on the order of 50-60 mph. The greatest threat for this is the NE coast closer to Penobscot Bay where a wind Advisory is up. All coastal areas should be prepared for strong winds, the chart above is for Portland. Rain begins tomorrow evening becoming heavy late at night. Winds will also be on the increase out of the SE. Peak rain and wind occurs 12-6 AM Thursday with wind gusts approaching 60 mph along the coast. A total of 1-1.5″ of rain is likely with more on the south-facing mountain slopes where 2-2.5″ is likely. I’ll have more updates tomorrow in a similar patter to today’s updates. Today will feature mainly sunny skies and nice temps as high pressure remains locked in over the region. Lows this morning are a bit chilly but will warm nicely to a few degrees on either side of 50 maybe with some cooler temps up north. Rain moves in tomorrow, I’ll have another update on that this evening.